When I'm in the cockpit of a fighter aircraft, the last thing I want to do is slow down — I certainly don't want to wait my turn. I need a joystick in my hand, a first-person view and buttons for machine guns and/or missiles. I was pretty sure Sid Meier of Civilization and Pirates! fame had finally created a game I did not want to play in Ace Patrol. I was mistaken. Show me a turn-based war game on a field of hexes, and I will show you a sleepy Fahey, curled up on the couch, snoring like a jackhammer. I understand the appeal of the genre, and I admire the folks that have the patience and understanding to make sense of it all without going insane. Ace Patrol has hexes. It has tiny aircraft moving, and then stopping while the enemy makes its counter-moves. It has red lines denoting hostile territory, and blue lines indicating the friendly bits. It's set in World War I, so there aren't even any missiles for me to play with. So why do I love it so? Because those sneaky folks at Firaxis have snuck role-playing progression into my turn-based strategy. Pilots in your squad level up as you use them, unlocking new manuevers, abilities and upgrades as they do so. Making sure your favorite pilot is armed with the freshest moves on the battlefield is an incredibly compelling reason to hit the mission select button over and over again. Missions play out as they would in tabletop war game. The player moves their units, then the enemy moves theirs. Each time one of the players' planes can move, a group of movement options appear on the screen. Initially the options are restricted to moving forward or turning, climbing and diving. As pilots unlock new manuevers, those choices expand. Now, instead of passing the enemy on a firing run, they can flip, changing directions while firing off a few round. The more experienced your pilots are, the more options they have. So yes, role-playing elements have me playing a strategy air combat game, something I have never been compelled to do before. It helps that the game is pretty, with a lovely on-screen button used to activate tilt controls, surveying each tiny battlefield with ease. It's very easy to pick up and play. Almost too easy. There are more than 120 missions to engage in, spread from 1916 to 1918 across four nations — Britain, U.S., Germany and France. You're not going to get all of that for free, of course. The initial download includes a limited number of missions on the British side. Unlocking the whole of the British campaign costs $.99, with the other nations available for $1.99 apiece or in a bundle for $3.99. Thereis also a selection of flying aces to purchase for a buck per, or in a super pack for $4.99. So that's $10 for all of the game content, with three additional per-instance power-ups running $.99 each. Not as great as just offering an entire bundle to unlock everything, as in Firaxis' recently-released Haunted Hollow, but certainly not as obnoxious a pay scheme as most other "free" titles. Sid Meier and friends haven't changed my mind about turn-based air combat games. 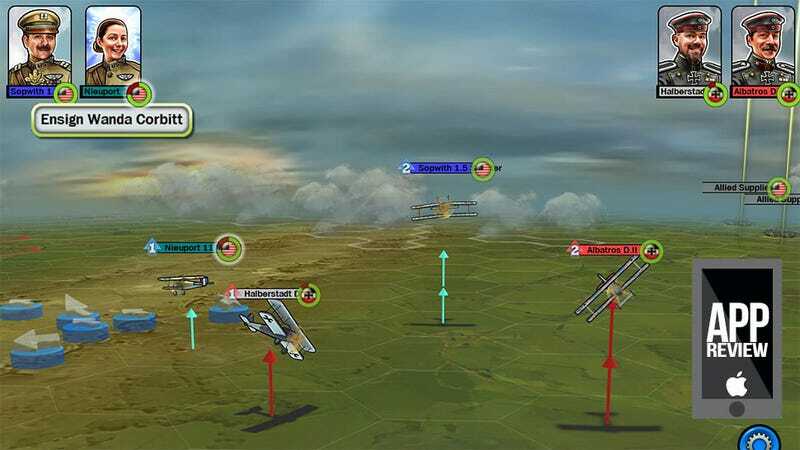 They've just changed turn-based air combat games into something much more accessible and enjoyable.